Luxury and European style have long been the hallmarks of Hapag-Lloyd Cruises. In 2019, they’re entering the adventure arena with the debut of two expedition vessels, HANSEATIC nature and HANSEATIC inspiration. The line is determined to deliver the same exceptional standards in the expedition arena that have made it a perennial award winner. When she launches in October 2019, the 230-passenger HANSEATIC inspiration will hold the highest ice class rating in the industry, PC6. She’ll accommodate only 199 guests on Antarctica cruises, allowing for an intimate experience in one of the world’s most remote regions. Design details of the new HANSEATIC inspiration include a shallow draught, offering extremely high maneuverability. She’ll be able to ply routes in hard-to-reach areas such as the Polar Regions. 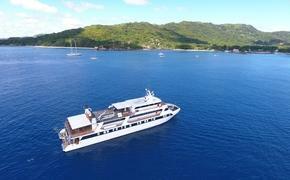 She’ll also venture to the warmer climates of South America, the Amazon and the Great Lakes. Along the way, passengers can take part in Zodiac launches and enjoy watersports from the marina at the ship’s stern. 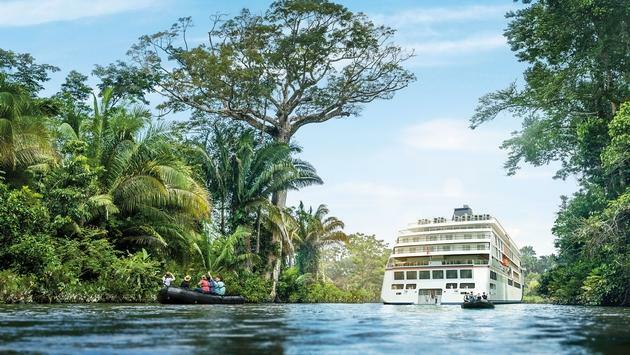 Highlights of HANSEATIC inspiration’s inaugural 2019/2020 season include Expeditions South and Central America in November and December of 2019. Jungles and white sandy beaches beckon on a trip from Bridgetown, Barbados to Callao, Peru. The ship will also make an 18-night expedition to the Chilean Fjords that ends in Ushuaia, Argentina. The journey offers the chance to experience the land of 1,000 contrasts, filled with volcanoes, majestic glaciers and the traces of ancient civilizations. Expeditions Antarctica aboard HANSEATIC inspiration take place from December 2019 to March 2020. Cruises offer a once-in-a-lifetime encounter with glaciers, icebergs and iconic wildlife of the region. Sightings of penguins, whales, elephant seals, cormorants and albatrosses abound. HANSEATIC inspiration can also divert its course in search of other exotic wildlife. Ports of call on the Antarctica cruises include Stanley, the Falkland Islands, South Georgia, the South Shetland Islands, and sailing through the Weddell Sea, Antarctic Peninsula, the legendary Drake Passage as well as Lemaire and Neumayer Channels. Special adventures await passengers on HANSEATIC inspiration’s Antarctica cruises. When weather conditions allow, passengers can camp ashore for a night in selected spots. A Zodiac ride will take them to shore, where tents are pitched and camping equipment put in place. A night in the world of eternal ice lies ahead. No river is as long as the Amazon and no rainforest is diverse. HANSEATIC inspiration offers the chance to experience the legendary region in luxury. Expeditions Amazon river takes place in April 2020. The ship will sail for 17 nights upstream from Belem to Iquitos. It returns downstream from Iquitos to Belem, plying a route that only small ships can navigate. The cruise offers the chance to see one of the world’s great ecosystems, filled with lush vegetation, exotic wildlife and untouched native villages. Adventure comes close to home with a Great Lakes June 2020 cruise. The ship will travel through the eight narrow locks of the Welland Canal, while on the journey from Toronto via Lake Ontario. Rarely experienced in luxury style, HANSEATIC inspiration offers a window into the great “ocean” embedded in the forests of North America. From Between July and September 2020, HANSEATIC inspiration offers its Expeditions Arctic. Three itineraries roundtrip from Kangerlussuaq call on Northwest Greenland, the Canadian Arctic, East Greenland and Disko Bay. It’s a land of mysterious ice formations, shimmering blue light and deep fjords. Arctic foxes, whales, seals, polar bears and musk oxen occupy this region, accessible to guests viz Zodiacs. Onboard lecturers and a crew experienced in polar travel make a trip aboard HANSEATIC inspiration one for the ages.